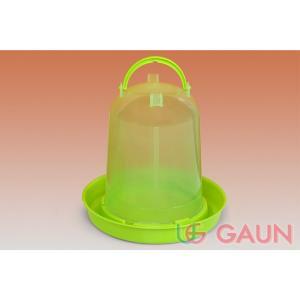 The hen Party 3 litre drinker is used for small chickens, pigeons, partridges or quail. It is made from high density, ultraviolet and frost resistant plastic. It has a twist-lock system and a strong handle. The drinkers are filled by inverting and unscrewing the base. Four legs on the top of the drinker enable the drinker to be stood on end whilst being filled. All drinkers also have a scale on the side. Dimensions: Diameter: 230 mm. Height: 220 mm.